Metro DC Lawn and Garden Blog: Time to put your mower out to pasture? Time to put your mower out to pasture? America's love affair with their lawns is one of the biggest challenges when it comes to environmentally friendly landscapes. Lawns are water hogs and can have pests and weeds that are frequently treated with harmful chemicals. Using gas powered equipment to keep a lawn manicured can put out more CO2 and other pollutants (plus noise) per hour run time than a Hummer. Eco-friendly options for landscapes can include minimizing the size of the lawn and replacing it with ground covers, gardens or permeable surfaces such as mulched beds and walkways. For the lawn that you do keep, make sure that it is mowed correctly, with the blade set to about three inches. Mulching mowers allow the grass clippings to be returned to the grass to put the nutrients back into the landscape. Before your lawn mower is put to bed for the winter, take a look at it and decide whether it is time to put it out to pasture all together and get a more eco-friendly option. A new lawn mower might be the perfect gift for a homeowner who is trying to be more eco-friendly in the landscape. 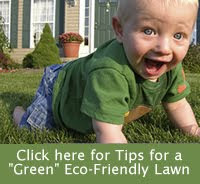 Eco-friendly options for lawn mowers include electric models, solar powered mowers, reel mowers and more.